A work of installation art that was reported stolen Tuesday morning was found inside Delta Upsilon (DU) house later that day, according to the University of Chicago Police Department (UCPD) and the artists involved. 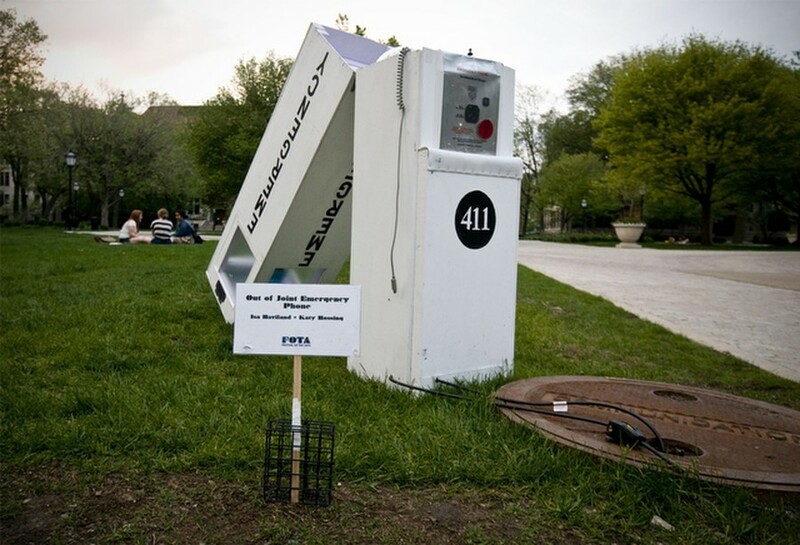 The piece, a mock-up of the ubiquitous blue-light Emergency Phones, dotting the Hyde Park cityscape, was stolen late Monday night from its location on the main quads outside Swift Hall. The thieves, two white men of standard build, were captured on University security cameras carrying it away minutes before 1 a.m. Tuesday morning. After filing a police report at 9:57 a.m., Rossing and co-creator Isa Haviland checked local dumpsters and put up fliers around campus asking for information on the stolen work. Over the next couple hours, they received word from the UCPD that the perpetrators had been seen on camera taking the piece toward University Avenue. Acting on that information, as well as on the physical description of the people involved, Rossing and Haviland went door to door asking for information from three frat houses, Alpha Delta Phi, Psi Upsilon, and Phi Gamma Delta, all of whose brothers said they had not seen anything. They arrived at DU last because of its location on Woodlawn Avenue. Upon approaching the house, Rossing said, they were able to see the piece through the back window. “It was sitting in their living room,” she said. At that point, Rossing said, they called the UCPD again, who contacted Dean of Students Susan Art. After a period of waiting, UCPD officers were let into the building by a DU brother and returned the piece to its original location at around 3:30 p.m.
DU President William Zapata declined to confirm or deny any of the above facts, though he released a statement on behalf of the fraternity. “Delta Upsilon sincerely regrets that there was a misappropriated item from FOTA found on its premise. This incident in no way reflects the integrity of its brotherhood nor its official policies. Delta Upsilon wishes to continue having an active role in campus life and a vibrant presence in community affairs,” Zapata wrote in an e-mail. With or without a DU comment, however, the artists had words for the thieves. According to Rossing, neither artist intends to pursue any kind of official action or reprisal against the fraternity, though she said that she expects to be compensated for parts of the piece that broke off during the heist and which had to be bought and replaced. She said that this would likely be settled as a personal matter. The piece, titled “Out of Joint Emergency Phone,” was inspired by a project by famed street artist Banksy that involved sawing a London telephone booth in half and then piecing it back together. Returned to its original site on the quads, the piece is now chained to a grate in the ground. However, that won’t stop Rossing and Haviland from presenting their art around campus—they filmed their search for the stolen work and are planning to screen a documentary of it at some point. FOTA has been an annual staple of the University art community since the 1960s. The theme of this year’s show was “Wired,” and it featured, aside from “Out of Joint,” a mix of digitally inspired works and live music showcases.